Bangalore-based micro finance lender CreditAccess Grameen’s initial public offering (IPO) will open for subscription between August 8 and August 10. 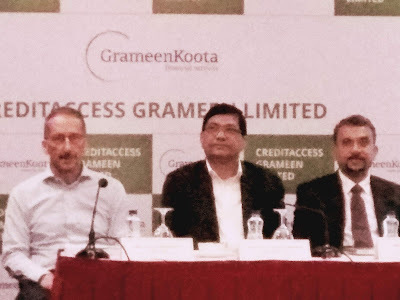 CreditAccess Grameen, a leading micro-finance institution headquartered in Bangalore, will open its initial public offer for subscription on August 8 with a price band at Rs 418-422 per share. The public issue comprises a fresh issue of up to Rs 630 crore and an offer for sale of up to 1,18,76,485 equity shares by the promoter, CreditAccess Asia N V.
The offer will close on August 10. Bids can be made for a minimum lot of 35 equity shares and in multiples of 35 equity shares thereafter. CreditAccess Grameen focused on providing micro-loans to women customers predominantly in Rural Areas in India. According to CRISIL Research, it was the third largest NBFC-MFI in India in terms of gross loan portfolio as of March 2017. As of March 2018, it covered 132 districts in the eight states (Karnataka, Maharashtra, Tamil Nadu, Chhattisgarh, Madhya Pradesh, Odisha, Kerala, Goa) and one union territory (Puducherry) in India through 516 branches and 4,544 loan officers. Its promoter CreditAccess Asia N V is a multinational company specialising in MSE financing (micro and small enterprise financing), which is backed by institutional investors and has micro-lending experience through its subsidiaries in four countries in Asia. Equity shares are proposed to be listed on BSE and NSE. ICICI Securities, Credit Suisse Securities (India), IIFL Holdings and Kotak Mahindra Capital Company are book running lead managers to the issue. The Bid/Offer Period closes on August 10, 2018. The company and the promoter selling shareholder in consultation with the BRLMs may consider participation by Anchor Investors in accordance with the ICDR Regulations. The Anchor Investor Bidding Date shall be one Working Day prior to the Offer Opening Date. The Price Band for the Offer is from Rs. 418 to Rs. 422 per Equity Share. Bids can be made for a minimum lot of 35 Equity Shares and in multiples of 35 Equity Shares thereafter. Kalyan Jewellers, one of India’s most trusted and leading jewellery brands, has today announced that it will be opening a brand new showroom on Varthur Main Road, Marathahalli - their 5th in the garden city. Brand Ambassadors Shri Shivrajkumar and Shri Nagarjuna along with the company’s Chairman and Managing Director T.S. Kalyanaraman and Executive Directors Rajesh Kalyanaraman and Ramesh Kalyanaraman, will inaugurate the same on 9th August, 2018 at 11:30 am. Thales, a leader in critical information systems, cybersecurity and data security, announces the findings of its 2018 Thales Data Threat Report, India edition, issued in conjunction with analyst firm 451 Research. The report finds that a striking 93% of Indian respondents plan on increasing IT security spending this year, the highest among all countries surveyed and well above the global average (78%). * Around 52% of Indian respondents reported a data breach last year, way above the global average (36%). Further, a full three quarters (75%) of respondents in India reported being breached at some time in the past, compared with just 67% globally. * 62% of Indian respondents report feeling ‘very’ or ‘extremely’ vulnerable to attacks on sensitive data (37% ‘extremely’ vulnerable), well ahead of the global average (44%). * Indian organisations are apparently not spending their valuable IT security funds in the right places. * Yet endpoint/mobile defenses are ranked at the top in terms of spending plans (81%), with data-at-rest at the bottom (54%). * 85% of Indian respondents say compliance is either ‘very’ or ‘extremely’ effective at stopping breaches, again way ahead of the global average (64%). 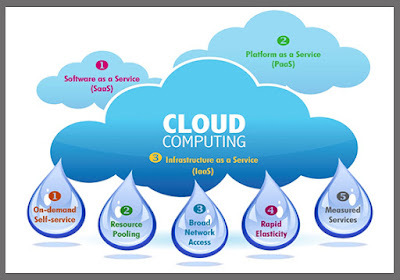 * Indian respondents are relatively unconcerned about storing sensitive data in cloud environments, with 92% of Indian respondents reporting that their organisations store sensitive data in some form of public cloud (either IaaS, PaaS or SaaS), well ahead of the global average of 74%. * Concerns about performance impacts and business processes are the top barriers cited in India to IT security, followed by perceptions of complexity (48%) and perceived need (37%). “The world today revolves around technology and more and more organisations are reshaping the way they do business with digital transformation. As the world becomes more connected, it also becomes more vulnerable. Cybersecurity has become an indispensable part of our digital technologies. At Thales, we have been helping our customers to think smarter and act faster during the complexities that arise each day and mitigate the challenges successfully. “This year’s India Data Threat Report 2018 emphasizes the need for change in security strategies to prevent the continuous increase in data breaches and also highlights privacy and data protection practices,” said Emmanuel de Roquefeuil, VP & Country Director, Thales in India. When Verify.Wiki LLC - a start-up that fights False News through a methodology called "reverse virality" - by combining crowdsourcing with social networking- saw the recent lynching incidents in India due to False WhatsApp messages, it immediately sprang into action. The company picked Chennai as a pilot city to test if it could prevent another tragedy. On July 13th, 2018, the company noticed two suspected False News stories propagating via WhatsApp, one asking people to punish a school teacher in Perambur, Chennai for hitting and kicking little children, and another circulating a young female doctor's photo, claiming she was treating patients for free in Chennai. Both these posts went viral on WhatsApp and Facebook in Chennai. 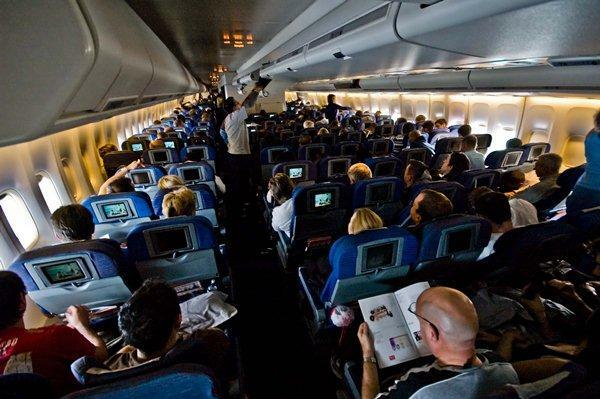 "The team immediately kicked off the pilot. They first learnt that the video that was circulated was from a school in Egypt, recorded in 2014, not from Perambur, Chennai. They also quickly uncovered the other story about the doctor was also false, propagated by a person who steals profile photos of young women from Facebook", said Siva Nadarajah, an adviser and investor at Verify.Wiki who recently requested the company to help with the deadly False News crisis in India. Once the stories were verified to be false through crowdsourced research, Verify.Wiki said its "reverse virality" approach ensured the propagation of the False News was stopped within hours. With reverse virality, the corrected version of the False News, was propagated back through the same path the story originated, via WhatsApp and Facebook, targeting those who might have consumed the False News. "We were able to stop both the False News stories within a few hours. We also noticed the propagation of those two false stories completely stopping within 24 hours. ", added Siva Nadarajah. "Imagine if Wikipedia and Facebook had a baby. You combine crowdsourcing with social networking. It's so powerful when it comes to transparency and credibility in fighting False News. We stopped seven False News stories just within two weeks of our pilot in Chennai. Some are harmless and some are deadly. The nice thing is anyone can anonymously submit a suspected False News and everyone can participate in the verification activities. It's a democratic process to fight False News", added Siva Nadarajah. 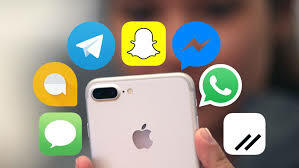 Facebook, the parent company of WhatsApp recently took full page newspaper advertisements to warn people of False News propagating via WhatsApp, after lynching incidents killed dozens of people across India. Infinix Mobile, the online smartphone brand from TRANSSION Holdings, today announced the launch of its global “SMART” series in India. The SMART 2 flaunts many industry-first innovations in the sub 6K smartphone segment such as the 18:9 Full View display, 8MP Low Light selfie with Dual LED Flash, Dual SIM, Dual VoLTE (4G+4G), and Face Unlock. 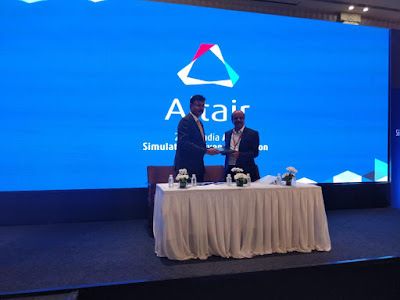 Altair Engineering India and KLE Technological University (KLE Tech) are interested to set up an Altair Design Innovation center (ADIC) at KLE University, Hubballi campus. Following are the core objective of this engagement and henceforth both Altair and KLE TECH will work towards achieving below goals and deliverables. 1. Provide Unlimited Student-License to any active student of KLE Tech during his degree or Post graduation degree course for his personal Laptop/Desktop so that he can actively pursue Altair HyperWorks Technology. 2. Facilitate Various Online Learning and certification courses (listed in Annexure). No limit to the number of students taking part in this initiative. Only certified students list will be published in Altair Industry outreach portal to facilitate Internship and placement at Altair, Altair Customers, Altair Distributors, and Altair Prospects. 3. Following eBooks to be used for framing Syllabus and as a reference book for the planned Industry oriented courses at KLE Tech. Note that these are by default used as Reference book for the certification courses of Altair. This will help KLE TECH to facilitate Syllabus making for Mechanical P.G and U.G courses. 4. Altair to help KLE Tech on following: It will help the institution to move up to the next level of competency in FEM techniques. KLE TECH is a Treasure of Knowledge. Altair to pursue in converting this knowledge to applied science useful to society. This MOU is a walk towards bigger collaboration to create win-win situation. Fullerton India Credit Company Limited (Fullerton India), a leading non-banking financial company with a strong pan-India presence, has successfully booked more than 150 Garima Loans – a toilet construction loan, in the pilot phase, benefitting over 1000 lives across 35 locations in rural India. Garima Loan offered under Fullerton India’s rural business arm, Gramshakti, aims to encourage inhabitants of rural areas to lead a hygienic lifestyle and elevate their standard of living by constructing toilets. Garima loan can be availed by a homeowner across 35 branches of Gramshakti in the states of Madhya Pradesh, Rajasthan, Tamil Nadu, Chhattisgarh, Karnataka, Gujarat, and Maharashtra. The ticket size of the loan ranges from Rs. 10,000 to Rs. 50,000, which can be repaid in easy instalments within the tenure of 6 to 24 months, depending on loan amount. Borrowers can also avail the subsidies offered under Swachh Bharat Mission while applying for the loan. Commenting on the launch, Vishal Wadhwa, Head- Rural Business, Fullerton India Credit Company Limited, said, “A number of households in rural areas are deprived of clean and hygienic toilets, which leads to infections and other health issues. Identifying this gap, Fullerton India launched Garima Loan to enable a dignified standard of living in India’s rural hinterlands. We have witnessed a high demand for the loan pan-India with as many as 25 loans disbursed in Godhra, Gujarat in a single day. This highlights the need for such products in rural and semi-urban areas. The launch of Garima further reinstates Gramshakti’s commitment to be the one-stop player for rural credit needs. 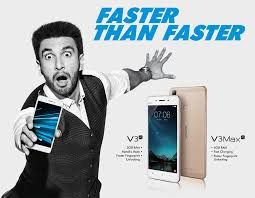 Vivo, the premium global smartphone brand, today announced their exciting Independence Day offers starting from 7th to 9th August (sale starts at midnight of 6th August) exclusively on its e-commerce store, shop.vivo.com/in. During Vivo’s ‘Freedom Carnival’, customers can avail attractive discounts, coupon deals and cashback offers on select range of Vivo smartphones and accessories during the three day online sale. Commemorating India’s 72 years of Independence, Vivo will be offering their latest best-sellers – NEX and V9 via flash sale for just INR 1947. Additionally, consumers will also stand a chance to purchase Vivo accessories such as earphones, and USB wires at an attractive price of INR 72 only. The flash for both the smartphones and accessories will commence at 12 noon for all three days and will last till stocks last. During the three days carnival, customers get up to INR 4000 cashback on select models. In addition, Vivo is offering 12-month zero-cost EMI scheme on all Vivo smartphones. Besides cashbacks and interest free shopping, customers will also get Bluetooth earphones worth INR 1200, free on purchase of NEX, X21 and V9. Customers can further sweeten their purchase with the help of readily available discount coupons redeemable on select smartphones and accessories. To give customised information, the BSE has introduced an AI-based chatbot Ask Motabhai, which can have a text-based conversation with the user and mine the BSE website. The chatbot has been built in partnership with Microsoft and Shephertz, a BSE statement said. 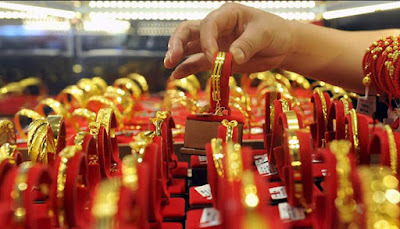 It will be convenient and faster for investors, especially small and retail, to get stock and market information. 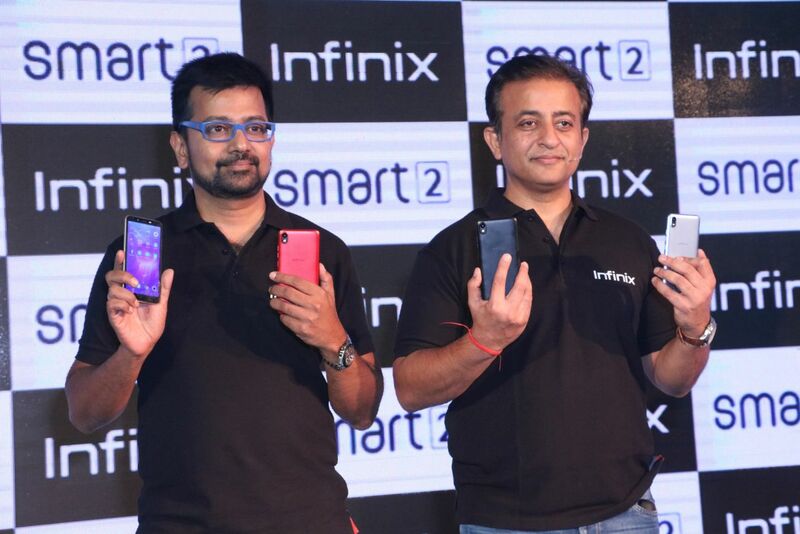 without having to go through any other channel,” its MD and CEO Ashishkumar Chauhan said. BSE makes available on its website the information on stock prices, corporate results and announcements, in real-time, of over 5,000 companies that are listed on it. 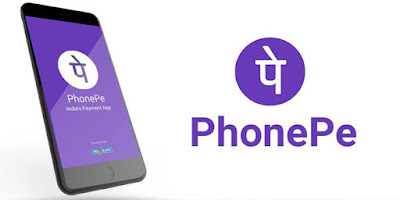 PhonePe, India’s fastest growing digital payments platform announced that it has emerged as the single largest player on the UPI network, ahead of other payment apps like Paytm and Tez. PhonePe also crossed the 100 million transaction mark in July, becoming the fastest Indian digital payments company to achieve this feat. According to National Payments Corporation of India (NPCI), its UPI platform saw 236 million total transactions in July. Of these, PhonePe had the largest market share of 40 per cent. PhonePe has been rapidly expanding its merchant base and is now accepted as a payment option across 3 lakh offline and online merchant outlets spanning food, travel, groceries, taxi cabs and movie ticketing. Mahindra Group, along with Project Nanhi Kali, aims to dispel the misconceptions around girl child education, by taking on a fresh view for the phrase with the campaign #LadkiHaathSeNikalJayegi. With the objective to demonstrate the opportunities that result from educating every girl child, this campaign will go live today across all digital channels of Mahindra Rise. A number of surround activities are planned, to spread the word and create a movement to support the cause. These activities will celebrate women who have achieved greatness by taking that crucial first step. These women will be both from outside Mahindra, as well as inspiring stories of our own Nanhi Kalis. “Mahindra is a socially responsible and trusted brand but with our RISE philosophy, we not only want to do good in the community, but also aim to inspire others to do good in order to drive societal change. This is the heart of Mahindra’s ‘Rise for Good’ campaigns. With the #LadkiHaathSeNikalJayegi campaign we’re turning this phrase on its head into a message of positive empowerment for girl child education and their ensuing success.” said Vivek Nayer, Chief Marketing Officer, Group Corporate Brand, Mahindra Group. The film has been conceptualized keeping these insights in consideration. A semi-urban setting was chosen for the film to ensure relatability, given that these beliefs exist not just in rural India, but also in cities. It is through a conversation between a girl and her father that the prevalent mindset is challenged by providing a new perspective to ‘Ladki Haath Se Nikal Jaayegi’. The film was conceived and scripted by FCB Interface. The Chief Creative Officer, from FCB Interface, Robby Mathew, said, "This film is an ode to the unsung heroes, who reject our society’s patriarchal mindset and encourage their daughters to fly. 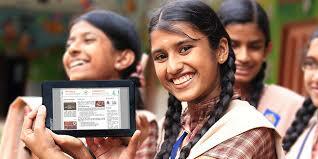 It is a celebration of a girl child’s dreams and her father’s determination to make it happen. It changes the meaning of this often-used phrase 'Ladki Hath Se Nikal Jaayegi’ and instead uses it to make a case for putting her destiny back into her own hands"
Project Nahi Kali, since 1996 has empowered over 350,000 girls, including 153,999 girls in this past year alone. This massive undertaking was made possible thanks to over 4,560 Community Associates who tutor our Nanhi Kalis for 2 hours every day, 6 days a week through the year, working across 5,262 Academic Support Centres in remote, tribal and rural pockets, as well as urban slums in 11 states of India. The objective of the campaign is to increase awareness and encourage more and more people to join the movement. Beyond India, Jet Airways operates flights to key international destinations in South East Asia, South Asia, Middle East, Europe and North America. The Jet Airways Group currently operates a fleet of 120 aircraft, comprising Boeing 777-300 ERs, Airbus A330-200/300, Next Generation Boeing 737s and ATR 72-500/600s. Amazon is the clear leader in the worldwide IaaS market with an estimated $12.2 billion revenue in 2017, up 25 percent from 2016. The largest of the IaaS providers, Amazon is also the most mature, enterprise-ready provider, with the strongest track record of customer success and the most useful partner ecosystem. Growth in 2017 was driven not only by customers that are migrating from traditional data centers to cloud IaaS, but also by customers implementing transformational digital business projects, reflecting its broad range of use cases. "This reflects a fundamental change in what and how organizations are consuming technology. Some legacy infrastructure offerings, such as IUS, are seeing lower and slower uptake that impacts the combined IaaS and IUS market," Nag said. 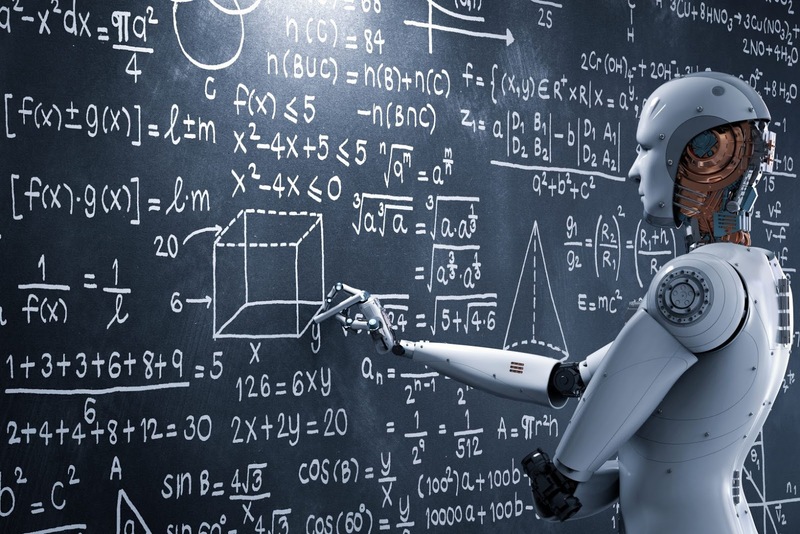 "Additionally, a groundswell of demand for cloud-skilled personnel is forcing technology providers to change how they compete to meet this exploding demand." 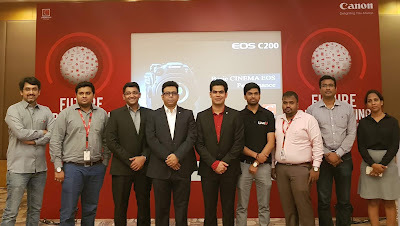 Inaugurating the ninth edition of Canon India’s extensive Cinema and Pro DV project ‘Future Broadcasting’, Bengaluru is all set to welcome the future of cinema trends. The project accomplished in collaboration with leading industry experts, including Avid/Real Image (a division of Qube Cinema Technologies), LiveU, G-Technology from Western Digital and Atomos, witnessed a series of workshops and events, designed to give hands on experience on products like Cinema EOS C200, Cinema EOS C300 Mark II and XA 15 & XF 405 along with ME20F-SH(Multi-purpose camera). With a firm focus on its objectives, the project got industry experts to demonstrate the workflow of these superlative solutions, confirming that these solutions will lead the forthcoming trends in the Cinema and PRO DV segment. The first leg of the workshop was organized in Guwahati and Imphal respectively in January 2018. The subsequent events were planned in Bhubaneshwar on February 19, followed by Kolkata on February 21st and Jaipur on March 18th. Following the success of the project in National Capital on 27th of April, Hyderabad on the 30th of May and Chennai on 1st June , the project now ventures into Bengaluru and will be followed by Kochi. Carmakers in India expressed a mixed bag of reactions towards sales in July. While a majority of manufacturers posted robust sales figures for the month, a few - including market leader Maruti Suzuki, surprisingly clocked a decline in car sales. Maruti Suzuki India reported a marginal decline in sales at 1,64,369 units in July. The company had sold 1,65,346 units in July last year. Domestic sales were up marginally at 1,54,150 units last month, against 1,54,001 units in the year ago month. However, exports in July were down by 9.9% at 10,219 units, against 11,345 units in the corresponding month last year. In comparison, the country’s second largest carmaker Hyundai Motor India reported a 7.7% increase in total sales at 59,590 units in July. The company had sold 55,315 units in July last year. Domestic sales rose 1.1% to 43,481 units last month, compared with 43,007 units in July 2017, while exports grew 31% in July to 16,109 units, against 12,308 units in the year-ago month. 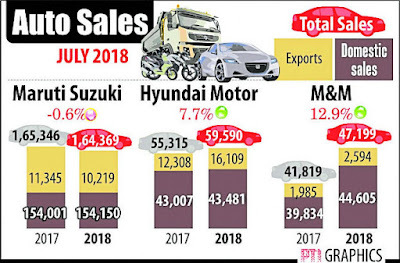 Homegrown Tata Motors recorded a strong growth of 21% in July, with its sales in the domestic market growing by 21% at 51,896 units, compared to 42,775 units over the previous year. 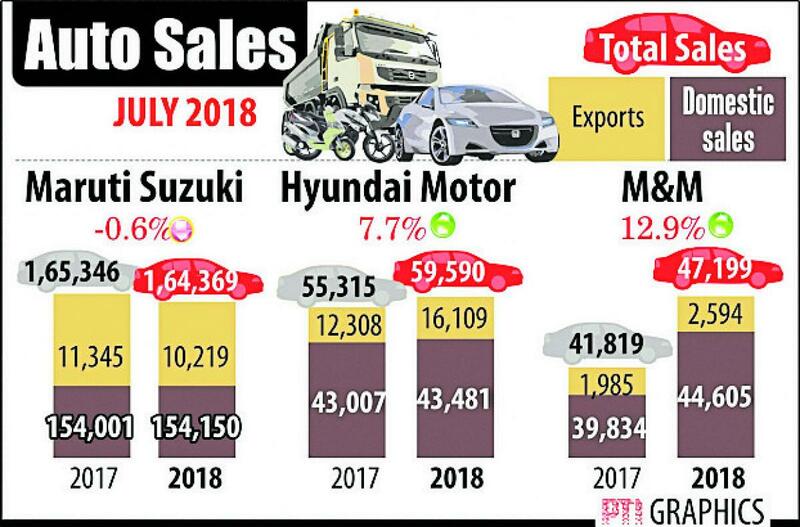 Toyota Kirloskar Motor sold a total of 13,677 units in the domestic market during July 2018. The company has been able to register a double-digit growth of 36% in June-July 2018, compared to the same period in 2017. Mahindra and Mahindra reported 13% increase in total sales at 47,199 units in July, having sold 41,819 units in the same month of the previous year. Newgen Software, a provider of Business Process Management (BPM), Enterprise Content Management (ECM), and Customer Communication Management (CCM) platforms, today released OmniScan Web 3.0. The new version of the scanning solution offers advanced document scanning capabilities, which helps businesses fast-track processes by capturing data and converting it into actionable business information. OmniScan Web 3.0 enables users to use web browsers to capture information and documents directly into business systems and processes. Leveraging the new version, organizations can ensure high-quality data output, reduced operating costs, better resource optimization and improved information security. "This version offers enhanced user experience and will help organizations drive enterprise-wide digitization with access to the relevant information for business use." said Diwakar Nigam, Chairman and Managing Director, Newgen Software. Nutanix, a leader in enterprise cloud computing, has announced the rapid uptake of its native hypervisor, AHV, among India customers who aim to improve efficiency and eliminate virtualization costs on licensing, maintenance and support. “The biggest benefit we experience with Nutanix AHV is simplicity. Nutanix has made the hypervisor invisible – which is how it should be; and this has helped reduce our IT admin efforts by over 40 percent. We have adopted AHV for running enterprise and big data workloads and find great value in Nutanix’s ability to reduce complexity that used to plague the traditional data centre,” said Rahi Racharla, CIO of The Multi Commodity Exchange of India Limited (MCX). 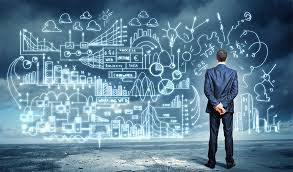 With AHV, hyperconverged infrastructure management, capacity planning, performance monitoring and common tasks such as deploying, cloning and protecting virtual machines are centrally managed through a single comprehensive application, Nutanix Prism, rather than utilizing disparate products and policies in a piecemeal strategy. Talentedge, India’s first Ed-Tech firm, leading in live and interactive learning for working professionals, have recently conducted a survey on their various courses. It was observed that an increasing number of professionals are opting for Human Resource (HR) learning programs. Enquiries generated for HR & Talent Management courses are at par to programs like Digital Marketing, Data Analytics and Big Data. The role of HR has changed due to digitalization. 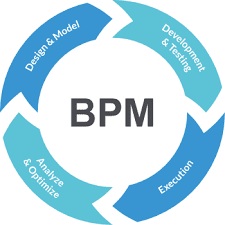 Until recently, HR systems were following periodic cycles, whereas now review and feedback is possible in real-time through interactive software and cloud based applications. These days there’s a requirement of a new breed of HR professional that possess the skills to transform the work environment to a more digitally organized system. Basis an observation made for online course trends in India it came to light that students enrolled in HR certificate courses from Southern India saw an increase of more than 50% this year as compared to last. Additionally, post-graduates opting for talent management courses have seen a year on year growth of 20%. A recent demand of skill development in a working professional even after 20 years of experience has generated the need for them to pursue flexible online courses. Undergraduates are seen opting for generic high value HR courses in lieu of an MBA. Thus, coupling the preferences of UG’s with 20+ years of experience and recent UG’s for generic HR courses leads to a further increase in this category. Toyota Technical Training Institute (TTTI), an institute designed to train bright talents from the rural corners of Karnataka, today celebrated its 9th convocation ceremony and conferred academic degrees to 52 students from the outgoing batch of 2015-2018 [3 years TTTI course]. The academic honors were handed over by the Chief Guest Dr. K P Krishnan, Secretary – Ministry of Skill Development and Entrepreneurship, Government of India along with Mr T. Kitagawa, Consul General of Japan, Bangalore and senior management representatives from Toyota Kirloskar Motor – Akito Tachibana – Managing Director, Shekar Viswanathan, Vice Chairman and Whole-time Director and Sailesh Shetty - Vice President, while proud parents, friends and relatives watched from the sea of audience members who turned out for the event. Considering the changing regulations from Safety - Fuel Efficiency [CAFÉ] - Emission norms, there is a continuous need for improvement in vehicle technologies. Therefore, there is tremendous need for highly trained manpower with right skill sets who understand the modern technology and its advancements, which stresses the need for quality training facilities to impart specialized skills. Corporate are working tirelessly to bridge the widening gap between the availability of skilled manpower and industry requirements, for an accelerated economic growth and steering towards greater industrial transformations. With a focus to bridge this gap that the industry is grappling with dearth of entry-level talent, TTTI imparts world-class skills training to young talents of economically weaker sections of the society in rural Karnataka and provides a dedicated three-year program that focuses on the holistic development of Knowledge, Skill, Body and Attitude. With a structure that ensures the highest standard of education, the curriculum offers a unique blend of complete learning experience, along with basic subjects, recreational activities and comprehensive training on automobile assembly, automobile paint, automobile weld and mechatronics. In addition, students are given practical training by applying the world renowned ‘Toyota Production Systems’ to the various manufacturing processes at the Toyota plant in Bidadi. Since establishment, the institute has trained over 531 students who have been inducted on job at Toyota Kirloskar Motor & other Toyota Group companies with 100% placements. Appreciating Toyota’s foresightedness in making the industry tomorrow ready, Dr. K. P. Krishnan – Secretary, Ministry of Skill Development and Entrepreneurship – Government of India, said, “Our nation have extraordinarily talented youngsters, who must be nurtured and provided with the best possible opportunities to excel in the competitive society. We need more corporates like Toyota to support government’s Skill India initiative to create opportunities, space and scope for the development of the talent of the Indian youth. I would like to applaud the efforts of the faculty and staff of Toyota Technical Training Institute towards enhancing employability of the rural youth and congratulate all the outgoing students a bright future and a successful career”. 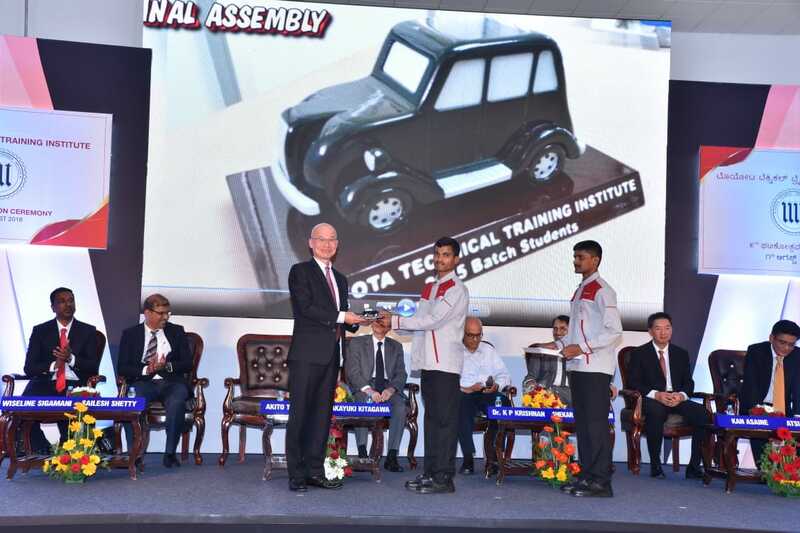 Handing over the degrees to the graduated students, Akito Tachibana, Managing Director - Toyota Kirloskar Motor said, “Toyota strongly believes that we have greater role in India than just manufacturing and selling safest and environment friendly cars. It goes beyond the core of our business to build a talent pool that can create a sustainable business environment. Toyota Technical Training Institute has been a significant arm of Toyota for more than a decade. Our aim here is to develop world-class workforce through a structured curriculum which not only enhances the students’ knowledge & core skill talents, but also focuses to train on the overall individual development with right attitude, work ethics and principles making them better citizens of the country. It is indeed a proud moment for all of us with TTTI graduates exceling in their skill sets to meet the industry standards and being globally competitive. Established in the year 2007 as a part of Toyota’s social initiatives, the first batch of students from TTTI received their academic degrees in 2010 in the gracious presence of Dr. Abdul Kalam, Former President of India. The institute is a fully residential school. The objective of TTTI is to develop good corporate citizens equipped with Toyota specific methodologies and create learning opportunities for the deserving individuals. The students during the course also get an opportunity to participate in the National Skill Competition & World Skill Competition (Skill Olympics) in 3 categories namely - Mechatronics, Car Painting, Prototype Modelling. The TTTI batch of 2011 secured 4th position in World Skill Competition 2015 held at Sao Paulo, Brazil & won “Medallion of Excellence”. At last year’s 44th World Skills Competition held at Abu Dhabi, Mr. Kiran, employee of Toyota Kirloskar Motor won the bronze medal in the Prototype Modelling Skill, Mr. H Varun and Mr. T A Anand Kumar who are also alumni of TTTI and employees of TKM, ranked sixth in the Mechatronics Skill category & won “Medallion of Excellence”. Over the years, TKM has undertaken holistic skill initiatives for the development of skilled manpower that ensures a secure and steady flow of qualified human resources not only for the community but also for the industry as a whole. Toyota’s vision to create a learning organization by developing competitive human resources among all stakeholders and they contributing towards the business sustainability. 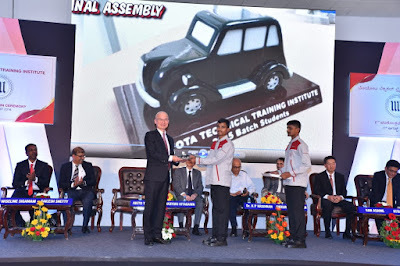 Besides TTTI, Toyota have curated some dedicated initiatives such as Toyota Apprentice Scheme [Training for Apprentice], Gurukul [In-house training for its employees], Toyota Technical Educational Program [Skill program for the students of Industrial & Technical Training Institutes] and many other skill initiatives to nurture a contingent workforce for the industry as a whole. As a long term plan of associating with Academia, Toyota aims to collaborate with the academic council to add Toyota unique traits in the study curriculum. Toyota also focuses to mentor students through Toyota Engineers to develop future ready skilled manpower covering wider spectrum of human resources with world-class competitive skill levels. As a responsible corporate, Toyota will continue the efforts to effectively contribute to skill enhancement of the budding workforce, in support of the common goal of SKILL INDIA MISSION. Through its robust skill development curriculum, Toyota focuses to build a strong work force for the industry as a whole. 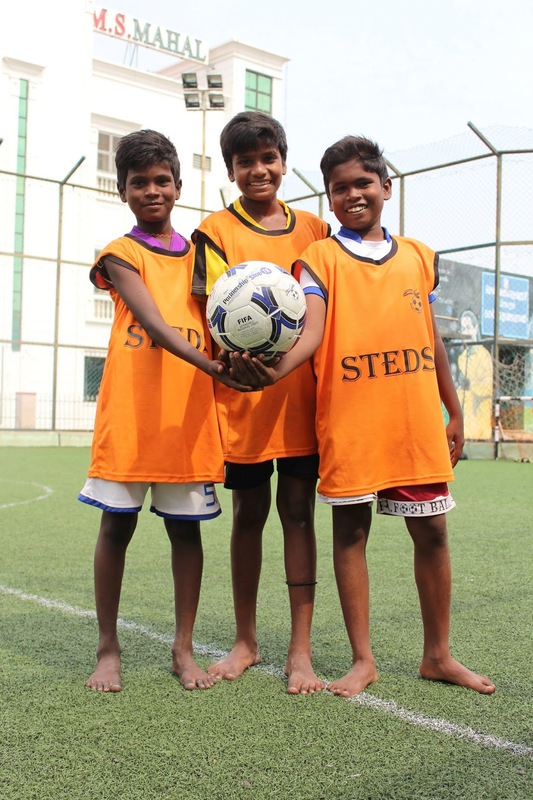 Child Rights and You (CRY) one of India’s leading NGO’s working on child rights will be organizing a tournament - AON Soccer for Child Rights on August 04, 2018 at the FIFA approved FSV Arena at Hennur – Bagalur Road, Bangalore. The event aims to provide children from the marginalized sector of the society the right exposure to life through the medium of sports. This one of a kind event where corporate teams come together with the marginalized sector of the society to uphold child rights using soccer as the language of change. Sport breaks boundaries and it motivates the underprivileged children to continue education. Buy your passes at Events High to see a spectacular game of soccer while ensuring lasting change for children! India’s leading real estate services provider ANAROCK Property Consultants have announced that industry veteran Mayank Saksena has joined the Firm as Managing Director - Land & Head - South India Residential Services. Prior to this appointment, Mayank Saksena was Managing Director of Land Services international property consultants JLL India, where he was also part of the India Leadership Council (ILC). During his tenure of over a decade there, he closed several high-ticket land deals and acquisition mandates. These include some of the largest land transactions on record across large cities in the country. At this point in time, Bengaluru, Hyderabad and Chennai still have unsold housing inventory of 85,000, 27,500 and 28,500 units respectively. Mayank Saksena will be based out of ANAROCK’s Bangalore office and his role begins with immediate effect. Sasken Technologies Ltd., (formerly Sasken Communication Technologies Ltd.), a leading product engineering and digital transformation solutions provider, today announced that it has become a member of the EtherCAT Technology Group (ETG). As part of this membership, Sasken will contribute to features of the EtherCAT standard as well as to the case study bank of EtherCAT technology use cases. Through this membership, Sasken aims to enable industrial product companies, who are deliberating ways to improve the performance of their next-generation products, accelerate the adoption of EtherCAT technology. Today, industrial companies are adopting industrial Ethernet technologies rapidly to leverage the mature Ethernet technology ecosystem. Among the Ethernet technologies available in the industrial domain, EtherCAT is one of the best options for its performance, reliability, synchronization, and simplicity which are seminal in the operations of industrial products. Sasken is enabling customers across the globe accelerate the adoption of industrial Ethernet technologies, especially EtherCAT, for their products and solutions. 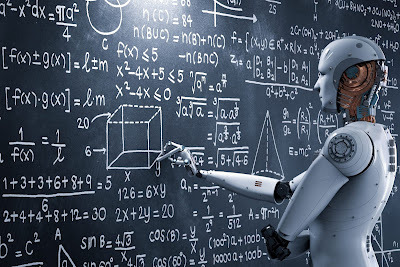 “Sasken Industrials has been engaging with customers to build next-generation industrial products that are ‘connected’ and ‘intelligent’. In the recent past, for a leading industrial conglomerate, we have migrated EtherCAT slave stack to TI-Sitara platform running VxWorks 7.0, for high-precision ultrasonic welding machines, which were the first of their kind in the market. 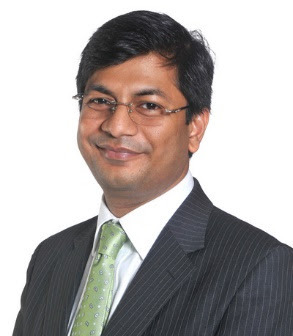 We are also working with a leading manufacturer of machine vision systems on enabling EtherCAT slave support on their next-gen computer vision cameras,” said Mihir Kumar, Senior VP and Head, Industrials Business, Sasken. “As a strong player in the Industrial Ethernet ecosystem, we anticipate that the ETG membership will open new avenues for us in various industrial domains such as robotics, high-precision machineries, factory automation products, etc. due to the rapid adoption of EtherCAT technology. 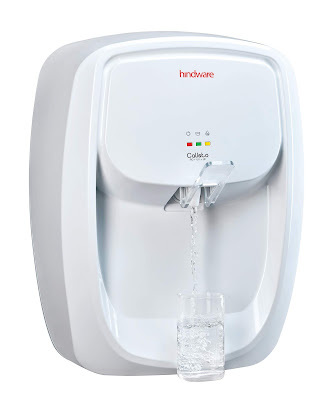 We are looking forward to leveraging the knowledge that this mature ecosystem provides as well as to contributing new use cases using EtherCAT technology to the group,” he added.